Boasimla is the Lower Subansiri District of Arunachal Pradesh is one of the project villages under FARM North East. This village is presumably a little ahead of others in terms of communication & transport but development is still in a very slow pace. FARM North East, however, seems to have unleashed a ray of optimism among the people of this village by motivating them to utilise their own potential & do what is best for them. “We saw the power of unity in us when we worked together to ban the popular soft drink in our area”, said Ms. D. Renia. Since last 3 years the post office of Boasimla was almost non-existent. The makeshift building was completely damaged & there were no officials attending to the much needed essential service that is otherwise enjoyed by citizens in almost every corner of the country. “I as an educated unemployed youth need to apply for various jobs & for that to send filled up job application forms via post but I was unable to do so & I had to travel 47 Kms to Ziro by spending my own pocket money of Rupees 400/-”, said a disappointed youth Rakhe Rakesh. 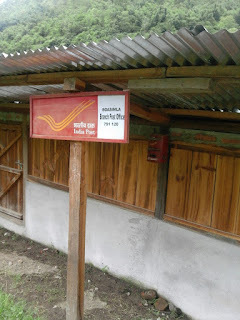 The nearest post office was at Ziro, the District headquarters of Lower Subansiri. Even students were at the receiving end as they had to travel to Ziro to apply for higher studies. Moreover, the community in Boasimla were deprived of taking benefits of various saving schemes of post office. “I hear that one can make savings in the post office, even I wanted to save but I have dropped the idea as I cannot be travelling to Ziro every month”, said Ms. Guchi Atick. 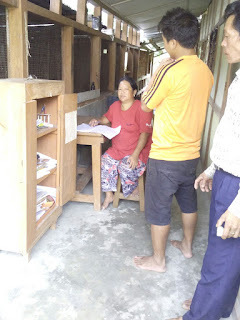 The project team of Itanagar Diocesan Empowerment Association (IDEA) was made aware of the issue of post office while they were interacting with the community during one of their routine visits. “We were busy implementing out project activities & it was during the month of January 2015 that we came to know about the problem”, said Ms. Boni Anima, member, Team IDEA. The people of boasimla shared their grievances with IDEA & pointed out that they are serious to do something about it. “We told IDEA friends that the issue of a regular post office have been a long standing demand of the people & that they must show us the way to fulfil our demand”, said Godak Taram. “How long would we go on discussing about this problem?”, said Choki Punung. The Farmers’ Club (FC) decided after rounds of meeting & consultations with Team IDEA that they would approach the authorities at Ziro to find a permanent solution. The farmers and the community decided to form a Village Action Team (VAT) consisting of 15 men & women together for taking up the issue with the concerned authorities during the month of February 2015. Team IDEA meanwhile was facilitating the peoples’ movement towards solving the issue. “As we did not know much, we were guided by our IDEA friends on whom to approach in Ziro for our issue to be addressed”, said Boni Dominic. The VAT held met the Superintendent Officer (CSO), Post Office at Ziro & while making a written request to CSO held several rounds of meetings during the month of March 2015. “It wasn’t easy for us to travel all the way to Ziro for meeting the CSO but deep in our heart we were determined to get the job done”, said Taw Halli. Initially, the CSO & other officials did not budge despite of several requests. But they gave in finally when they realised that it was a genuine issue. The officials were convinced that the people of Boasimla & nearby areas have been deprived of a pot office since many years and those they genuinely deserved one in their area. CSO was prompt enough to pass on official order to make the post office operational with immediate effect. The people in turn also made a noble gesture by volunteering themselves for the construction of the post office building. Boasimla, today has a fully functional post office with staffs regularly attending to peoples’ needs. “Our struggle bore results & we feel delighted about it”, said Rigio Yakio.